I recently met the 39th President of the United States, President Jimmy Carter, at the Jimmy Carter Presidential Library & Museum. I went to the Carter Presidential Museum with the intent to meet President Carter, who was signing copies of his latest book, "White House Diary," and of course to acquire a signed copy for my personal collection of autographed books. My second goal was to tour the museum. Both were met with success…the museum first. Originally, the Center was an idea for a place where President Carter imagined he could continue waging peace, fighting disease and inspiring hope around the world following his, as he calls it, "involuntary retirement" from service in the White House. The Carter Center is an impressive complex that includes international meeting spaces for effecting global change; blossoming gardens for reflection on the human condition; a research library brimming with knowledge; and a museum that fully chronicles the life of a Nobel Peace Prize laureate and President of the United States. 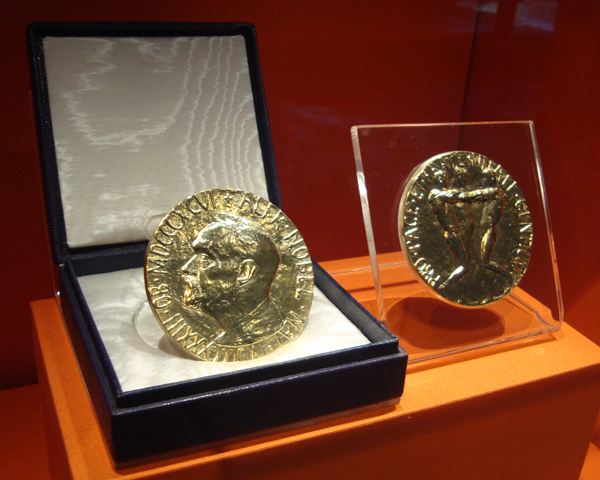 This post covers only the tip of the iceberg of the wonders to be discovered in the museum. The Carter Presidential Museum is a collection of artifacts, films and replicas that chronicle the life of President Carter. And quite frankly, it's a collection that rivals even that of a Smithsonian museum. I arrived early on the afternoon of the President's book signing to acquire a book in time for the signing and to have enough time to tour the museum and I was greeted by very friendly and helpful museum staff. The "all-new" museum, different from many other tourist destinations, begins and ends in the (modest) gift shop. The gift shop was buzzing with activity…others seeking a presidential autograph, people curious about the Center, and museum staff working with security and visitors. The museum had been closed off for book-signing preparations (the line for autographs would later wrap all the way through the massive museum). My strongly voiced intent on visiting the museum this day translated into convincing one of the museum managers to grant me access. He escorted me past security to the entrance of the museum (I was very impressed with this level of customer service!). his and former First Lady Rosalynn Carter's global human rights efforts. The early years exhibits include photographs of his family and historical accounts of Carter's earliest influences, specifically the conflicting personalities of his parents. It also imparts the love and support they provided during his early development. 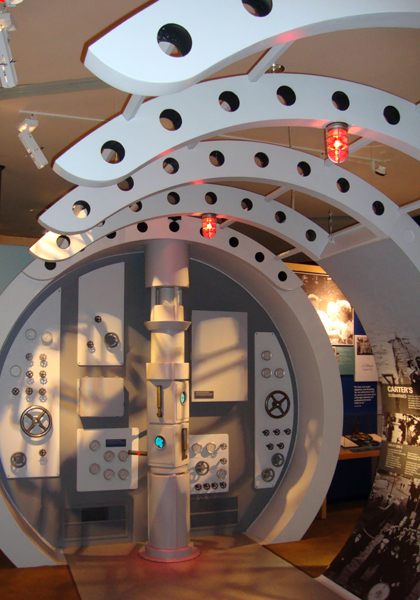 Chronicling Carter's first career choice, that of a Naval officer serving on a submarine, his Naval years exhibit includes a life-size, somewhat abstract display of the innards of a submarine and it's periscope components. It also includes a dress whites uniform worn by Carter. After Carter's presidency the USS Jimmy Carter (SSN 23), a US Navy submarine, was commissioned. To-be-president Carter entered politics following the death of his father, influenced by stories of the difference his father made in the lives of people he knew. 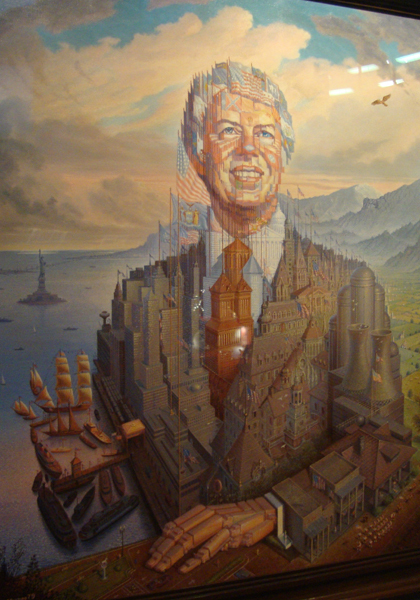 The exhibits up to this point in his life, and further, cover Carter's life in great detail. The exhibits covering President Carter's four years in the White House also include artifacts and photographs that tell of U.S. and world events at that time. 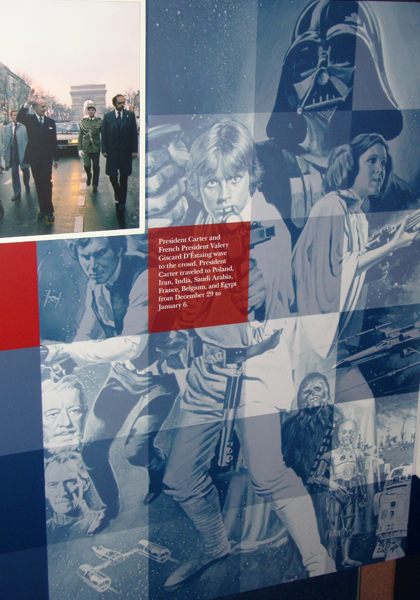 Of note, the premier of the global cinematic sensation "Star Wars" (a personal favorite) and the most popular television show at the time, "Dallas." Exciting and unexpected, I happened upon an exact replica of the Oval Office! I'd not reviewed the contents of the museum prior to visiting, so most of what I discovered was unexpected. The Oval Office exhibit was exactly as it was decorated when President Carter was in office, down to the "The Buck Stops Here" desk name plate. The exhibits noting Carter's term are substantial in diversity of aspect as well as content. They include a sizable rotunda that serves as an opportunity to explore a "day in the life" of the President. Additionally, visitors have a chance to pseudo-explore some of the millions of documents created during the Carter administration. The final leg of the exhibit, more than a quarter of the museum space, covers the Carter's human rights, philanthropic and charitable endeavors around the world. One particular exhibit allows would-be travelers to "join" the Carter's on a voyage of spreading hope in places desperately needed. The museum, a grand achievement, tells the story of a man who lives the American Dream, served productively in U.S. Politics, and today continues to give heart and soul in waging peace, fighting disease and inspiring hope. Meeting President Carter, for a second time, was indeed a remarkable occasion. Any occasion to meet such a distinguished human being, someone who has made a lasting difference, makes for a cherished memory. I first met President Carter and former First Lady Rosalynn Carter at the John F. Kennedy Center for the Performing Arts in November 2002. I found myself equally impressed with him at today’s meeting—his courage and strength continue to shine. Do I plan to return to the museum? There's so much more to explore, so much more to see than what I had the opportunity to see on this visit, so yes, I will definitely return. I will return to see the museum as well as to see the gardens and the library, which will be another blog post. 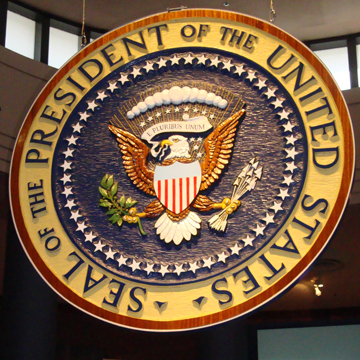 What would you hope to see when touring the Carter Presidential Museum? Hours: Monday-Saturday 9 a.m. – 4:45 p.m.; Sunday 12 p.m. – 4:45 p.m.